As part of the UP Institute for Sustainable Malaria Control’s (UP ISMC), 2018 Malaria Awareness Programme, its postgraduate student forum started the “Malaria is Everyday” initiative. This initiative recognises that people in rural malaria-endemic communities struggle with the reality of malaria daily. This is in addition to other major challenges such as food security and access to clothing. People in rural malaria-endemic areas often do not have quick or easy access to a clinic for treatment should they get sick, and by the time they realise that they might have more than just the flu, the disease has become severe malaria. In many cases it is too late to treat malaria effectively. Malaria is both preventable and treatable, but treatment should occur as quickly as possible once a patient has been diagnosed with the disease. The problem with malaria is that it has similar symptoms to the common flu and other diseases. At the onset of the disease, one experiences fever, chills, headaches, malaise, muscle aches, nausea, sweats, and vomiting. However, malaria can rapidly develop into a severe and life-threatening disease. 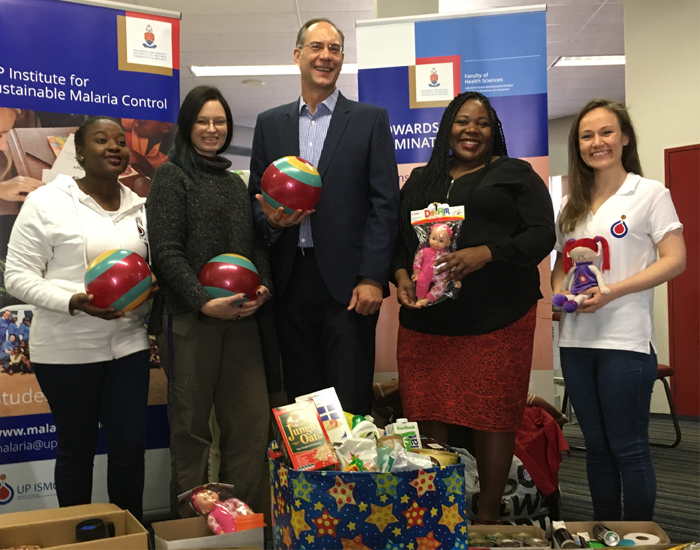 The UP ISMC teamed up with four University of Pretoria (UP) libraries where each aimed to collect a minimum of 67 items to be distributed to clinics in the malaria-endemic Limpopo River Valley (LRV), Vhembe District, Limpopo. This was part of the Institute’s Mandela Day activities. The “Malaria is Everyday” Initiative, in collaboration with the Medical and Basic Medical Sciences libraries at Prinshof Campus; Merensky 2 Library at Hatfield Campus; and the Jotella F Soga Library at Onderstepoort, each collected non-perishable food; clothing for babies, children and adults; toys and toiletries. The libraries ‘competed’ amongst themselves purely to motivate staff and students to donate items. 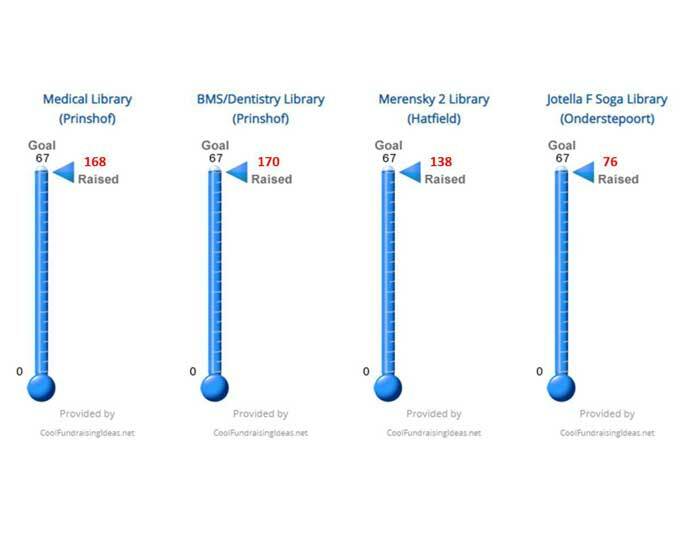 The libraries did regular counts on the number of items collected and this was publicised on the UP ISMC’s website and social media platforms. It was also shared on the UP Library Services’ social media platforms. The UP ISMC Student Forum will deliver the items to clinics in Vhembe at the end of September. Annually, this region has the highest number of malaria cases in South Africa. With the malaria season starting in September, more people will be heading to the clinics for treatment, where the sisters will distribute the items as needed. “During the trip, the students will also do some malaria awareness work and have the opportunity to visit some of the villages where UP ISMC researchers are collecting data for the Institute’s flagship Remote Sensing for Malaria Control in Africa (ReSMaCA) programme,” said Prof De Jager. The programme is a collaboration between researchers at the UP ISMC, French researchers, the South African Weather Service, the French National Space Agency and other tertiary and research institutions. It determines how malaria is distributed over space and time through the use of remote sensing (satellite technology), by looking at the meteorological and environmental conditions; human factors and movement; and malaria mosquito (vector) and parasite habits; and habitats as possible drivers of the distribution of malaria. The libraries have indicated their interest in collaborating next year, while Prof De Jager thanked them for the collaboration and support towards the rural communities.